What happens if you stack 50,000 sqm of urban sprawl and 10,000 sqm worth of trees on top of each other? 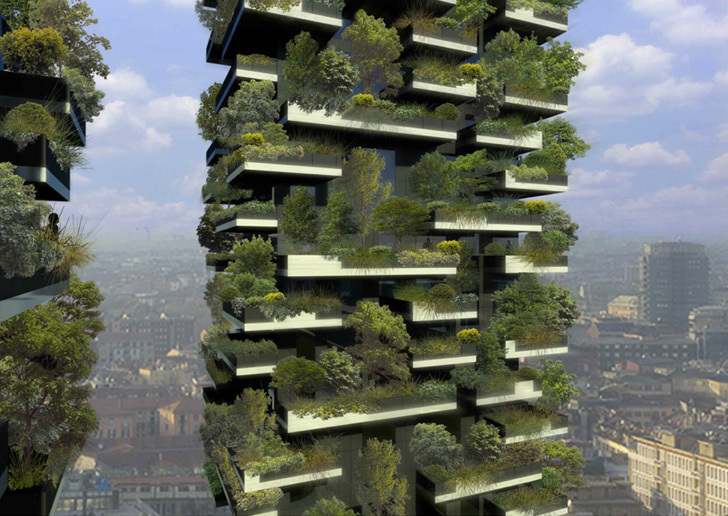 You get a vertical forest, or Bosco Verticale, currently under construction in Milan, Italy. The project responds to urbanisation and its negative side effects in a very distinct way. We know about the positive building qualities of plants, i.e. their contribution to air quality as well as insulation. The two buildings will host 900 trees as well as plenty of other plants, says the architect Stefano Boeri. Together they will absorb CO2 and dust particles, produce humidity and oxygen. Irrigation will happen to a large extent via grey waters produced by the buildings. With Milan being Europe’s capital of pollution, such reforestation projects are also good news for the wider environment and the city’s climate. So could our future cities be all about vertical farms and forests? For now, this largely remains science fiction. With the Bosco Verticale’s price tag at EUR 65m, flats will mainly sell to the premium market. 900 trees on their own aren’t all that much, either, unless you change building regulations and make 10 trees per each new floor mandatory. European cities, with their old buildings substance, are perhaps not the best candidates for such large-scale reforestation taking place. With their dynamism and shorter building lifespans, Asian cities are probably better placed. Then again, it’s perhaps better to spend the money on cheaper but more effective green fixes to your city. Tokyo Green Space collects fantastic examples and ideas from around Tokyo in that regard. Japan’s capital has countless surprising patches of vegetation, but also too many of the ubiquitous parking lots covering empty building plots. New photos and an update on the construction process of Bosco Verticale are here, whereas the original story on Inhabitat is here. This entry was posted in Agriculture, Architecture, Future ideas by benbansal. Bookmark the permalink.